The Swan River Colony was founded in 1829. The initial economic footing of the colony was somewhat marginal due to the small population. As a consequence the first railways were not built until the 1870's. The colonial government was not in a position to fund large public works. The first railways built in Western Australia were therefore constructed by private timber companies to transport sawn timber from the sawmills to the coast for export. The Western Australian Timber Company Limited constructed the first line from Yokonup (now Yoganup) to the company jetty at Lockeville on Geographe Bay. The line was 12 miles in length and built to a gauge of 3 foot 6 inches (1067mm). The company ordered a small locomotive from the Victoria Foundry at Ballaarat, Victoria. After a number extensions to the line the Wonnerup to Jarrahwood section was bought by the government in 1907. By the 1870's the economy of the Western Australian economy had improved to the extent that the first government railway construction could be considered. At this time efficient means of transport was desperately needed. It was said that the cost of transporting wool the 70 miles from the Avon Valley to the coast at Fremantle was the same as shipping the wool from Fremantle to England. The first Government Railway was built between Geraldton and Northhampton to service the lead mines. Construction commenced in 1874 but due to various difficulties the line did not open until 1879. By then the cost of construction had doubled and the line was not a financial success due to the fall in the price of lead. In the early years traffic on the railway exceeded all expectations. There was however little money provided by the government for rollingstock or maintenance. This resulted in a large proportion of the locomotives being out of service for repair. This situation, at one point, almost brought traffic to a halt on the railway. This situation continued until the 1890's when Western Australia's economy was put on a sounder footing with the discovery of gold in the Yilgarn District. The late 19th century also saw the development of forestry agricultural industry in the colony. To service these growing industries the South Western Railway from Perth to Bunbury was completed in 1893. Branches to Collie, which supplied coal for the system, and Bridgetown were added in 1897 and 1898 respectively. The first light agricultural line from York to Greenhills was opened in 1898 as a response to the needs of farmers in outlying agricultural districts. The first Government railway lines had been built as cheaply as possible without consideration to efficient running or maintenance. The line over the Darling Ranges was steeply graded and the locomotives, such as the A class, were small with low tractive efforts. As a result the loads that were able to be hauled were very low leading to inefficiencies. During this time the colony had been plagued by a lack of skilled workers. Thus on the railways many of the workers had little or no railway experience. As a result maintenance standards were low and breakdowns frequent at times up to half the fleet of locomotives could be out of service awaiting repairs. 1890 brought responsible government to the colony of Western Australia. Under responsible government the parliament was able to undertake the raising of loan funds to undertake much needed public works. The Premier John Forrest realised that to undertake these public works would require the appointment of an Engineer in Chief to oversee the work. After much searching the Government appointed C.Y. O'Conner chief engineer. O'Conner managed to persuade the Government that significant spending on improvements was required to rejuvenate the railway system. By placing into service larger locomotives such as the K class, laying heavier 58lb rails in place of the light 46lb rails, and by deviating the Eastern Railway by the more easily graded Swan View route heavier loads were able to be hauled at higher speeds. This resulted in considerable savings in running costs to the railway. There was also a considerable backlog in essential maintenance work. The existing workshops at Fremantle were small, poorly sited and under-equipped. O'Conner ordered large amounts of machinery so as to be able to undertake the outstanding work. This resulted in severe congestion at the workshops with work often being undertaken in the open. To overcome these problems O'Conner proposed to relocate the railway workshops to a better situated location. A site on the Helena River at Midland Junction was chosen. 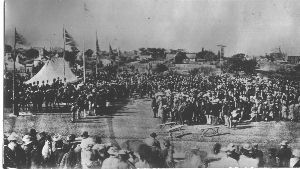 There was however considerable political opposition to moving the workshops from Fremantle, as well as concerns as to the cost of the undertaking. Thus it was not until 1901 that the government undertook to build new workshops at Midland and it was not until 1904 that the first work was transferred from Fremantle to Midland. To put the effects of this rejuvenation in perspective, in the twelve years prior to the arrival of C.Y. O'Conner as chief engineer the railways had acquired 188 miles (300km) of railway at a total cost of £833,000 and in nine of the twelve years the railways had run at a loss. During the five and a half years when O'Conner had direct control of the railways the colony obtained 400 miles of new line for a cost of £1.483m. Furthemore the new lines were built to a higher standard using heavier rail. This enabled the government to the loss into a net gain with the ability to cover both running costs and interest charges.